Last week I noticed these two Instagram posts from Philly-based artist David Guinn that showed a much larger, several-storied version of his Electric Street mural co-created with fellow artist Drew Billiau. The Electric Street mural, you might remember, was created in South Philly in the summer of 2016 and quickly caught the attention of Philadelphians and people around the world alike. Seriously, the installation was written about by dozens and dozens of national and international news outlets and blogs, which you can imagine is pretty rare for a single mural in Philly or elsewhere. When I noticed that David and Drew were creating a massive version of their collaborative work in Toronto, Canada, and not in Philly, I got a little bummed. Pumped for the artists, of course, who are getting paid and getting to do big things! But bummed that, it seemed, Philly couldn’t or didn’t find the funding or will to scale this amazing idea the way another city could. Then I got a direct message. The message was from Visit Philly’s Britney Norman, who reminded me that I was actually invited to a press conference a few months ago that announced such a project upcoming in Philly. (Thank you for the reminder, Britney!) And while I do remember that I couldn’t go to that press conference, I’m surprised I didn’t quickly hear more about the project afterwards, considering just how incredible it’s going to be. Titled Electric Philadelphia, David Guinn and Drew Billiau’s next neon mural is slated to be complete by the summer of 2019 in Philadelphia’s Historic District. 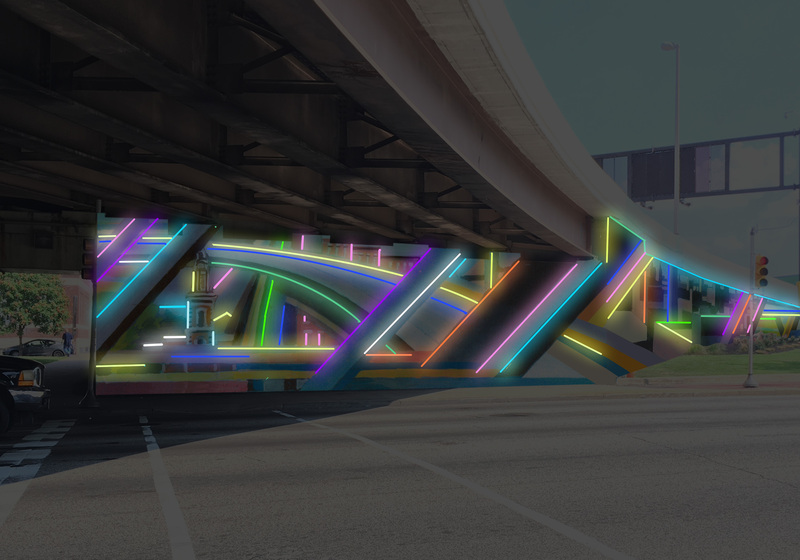 In total, the artwork will be 8,500-square-foot and sit adjacent to Franklin Square, filling the 6th Street Bridge underpass that’s under the Ben Franklin Bridge. Like Electric Street, it will be painted with bold color in addition to being lit so that the mural illuminates day and night. And just like the Electric Street mural that was funded in part to try and organically deter some late-night bar patrons from being too rowdy on the otherwise isolated Percy street in South Philly where it was installed, this new Electric Philadelphia mural appears likely to have been supported due to some considerations for public health. As Mural Arts Philadelphia Executive Director Jane Golden notes in the same press release: “We are so pleased to help create a new, vibrant gateway to Philadelphia’s Historic District that will bring beauty as well as safety to this pedestrian, bike, and car thoroughfare.” I can only imagine this mural could help slow drivers down and help to make them more aware of their surroundings as they navigate this heavily trafficked area. The mural is supported by Visit Philadelphia, Mural Arts Philadelphia, AP Construction, and Historic Philadelphia, in partnership with PennDOT. And I’ll be sure to photograph it and talk about it more as it goes up this summer, so stay tuned!